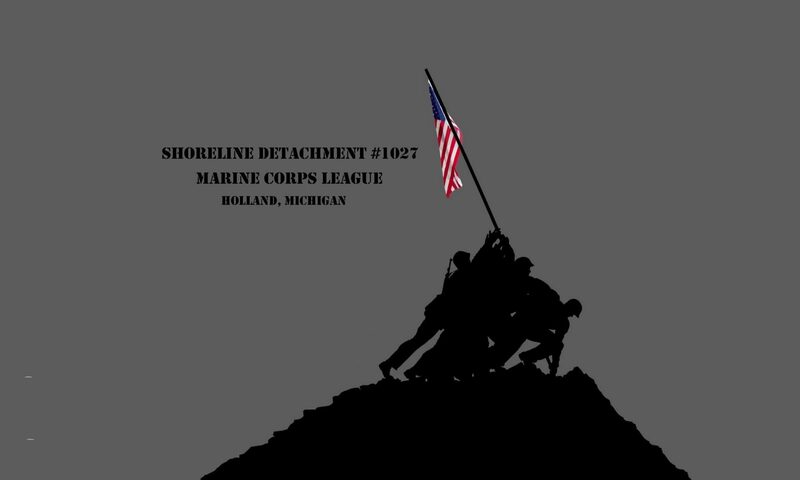 On April 20, 2019 our Shoreline Detachment fell out to our Spring Flag Retirement. 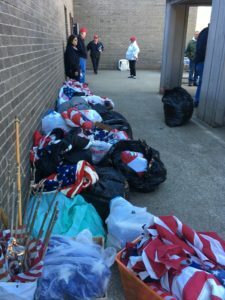 After the formal ceremony, we retired 762 U.S. flags. We are honored to be the caretaker of this task for the West Michigan shoreline communities. More pictures are shown on the pictures page of this website. Staff Sergeant Reckless (c. 1948 – May 13, 1968), a decorated war horse who held official rank in the United States military, was a mare of Mongolian horse breeding. Out of a race horse dam, she was purchased in October 1952 for $250 from a Korean stable-boy at the Seoul racetrack who needed money to buy an artificial leg for his sister. 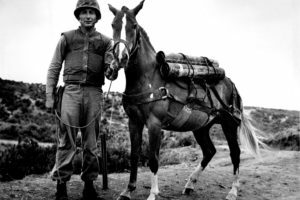 Reckless was bought by members of the United States Marine Corps and trained to be a pack horse for the Recoilless Rifle Platoon, Anti-Tank Company, 5th Marine Regiment, 1st Marine Division. She quickly became part of the unit and was allowed to roam freely through camp, entering the Marines’ tents, where she would sleep on cold nights, and was known for her willingness to eat nearly anything, including scrambled eggs, beer, Coca-Cola and, once, about $30 worth of poker chips. She served in numerous combat actions during the Korean War, carrying supplies and ammunition, and was also used to evacuate wounded. Learning each supply route after only a couple of trips, she often traveled to deliver supplies to the troops on her own, without benefit of a handler. The highlight of her nine-month military career came in late March 1953 during the Battle for Outpost Vegas when, in a single day, she made 51 solo trips to resupply multiple front line units. She was wounded in combat twice, given the battlefield rank of corporal in 1953, and then a battlefield promotion to sergeant in 1954, several months after the war ended. She also became the first horse in the Marine Corps known to have participated in an amphibious landing, and following the war was awarded two Purple Hearts, a Marine Corps Good Conduct Medal, was included in her unit’s Presidential Unit Citations from two countries, as well as other military honors. On November 26, 1950, ten thousand men of the First Marine Division, along with elements of two Army regimental combat teams, a detachment of British Royal Marine commandos and some South Korean policemen were completely surrounded by over ten divisions of Chinese troops in rugged mountains near the Chosin Reservoir. Chairman Mao himself had ordered the Marines annihilated, and Chinese General Song Shi-Lun gave it his best shot, throwing human waves of his 120,000 soldiers against the heavily outnumbered allied forces. A massive cold front blew in from Siberia, and with it, the coldest winter in recorded Korean history For the encircled allies at the Chosin Reservoir, daytime temperatures averaged five degrees below zero, while nights plunged to minus 35 and lower. The Chinese used the ravines between ridges, protected from rifle fire, to marshal their forces between attacks. The Marines’ 60-millimeter mortars, capable of delivering high, arcing fire over the ridgelines, breaking up those human waves, became perhaps the most valuable weapon the Marines had. But their supply of mortar rounds was quickly depleted. Emergency requests for resupply were sent by radio, using code words for specific items. The code for 60mm mortar ammo was “Tootsie Rolls” but the radio operator receiving that urgent request didn’t have the Marines’ code sheets. All he knew was that the request came from command authority, it was extremely urgent and there were tons of Tootsie Rolls at supply bases in Japan. 8th and I, Bravo Company is home to the Marine Corps Body Bearer Section. The section is comprised of 15 Marines whose primary mission is to bear the caskets at funerals for Marines, former Marines, and Marine family members at Arlington National Cemetery and the surrounding cemeteries in the National Capitol Region. On occasion, they are called to travel to locations all around the country to support funerals for senior statesmen, heads of state, and former Presidents of the United States. John Canley led Marines through the streets fighting in the Vietnamese city of Hue more than 50 years ago. The Battle of Hue took place during the Tet Offensive, Jan. 31-Feb. 6, 1968. Canley, now 80 and a retired sergeant major, carried several wounded Marines while under heavy enemy fire and assumed command to maintain the unit’s organization and morale in what’s known as the most chaotic battle of the Vietnam War. Canley was wounded more than once during the fighting, but still continued pushing forward. As of October 1 2017 Uniform Sales has been rolled into the PX system. Veterans have access to the On-line PX system, but not the physical outlets. To gain access, go to https://www.vetverify.org/ . That will get you a “pass” to access any of the on-line PX’s. Once verified you can go to https://www.shopmyexchange.com/veterans and create an account. Ruth Price, mother of GySgt Daniel Price, who died in Afghanistan, July 2012, and native of Holland, MI, invited me to her house today. I received a signed copy of her new book, NO STRAY BULLETS, the story of GySgt Price. The book is available on Amazon.com as well as Reader’s World in Holland. The Shoreline Detachment’s donation of $800.00 for the family meal at the funeral is noted in the book on page 132. There is a paragraph on our donation via a fundraising effort we did in Grand Haven at the American Legion Post serving meals. Go check it out and buy the book! Dan bought the Detachment 3 copies. They can be borrowed from our quarters at the VFW. There has been some discussion around the Cold War Medal / Ribbon. In 1998, Congress directed the Secretary of Defense to establish a certificate to honor United States Armed Forces members as well as eligible civilians who contributed honorably to the Cold War effort between September 2, 1945 and December 26, 1991. Those who received the Cold War Recognition Certificate may wish to accompany it with a medal and ribbon, though as an independently created award it is not eligible for wear on military uniforms. In other words, it is good for the shadowbox, not for the uniform. There are a number of Military Veterans retail sites that sell this medal if you wish to purchase it.